That evening at the TVCWDA monthly dance, they will do a special performance of their competition routines. Jeremy will also teach some variations of the Cowboy Cha Cha from 6:30 to 7:00. 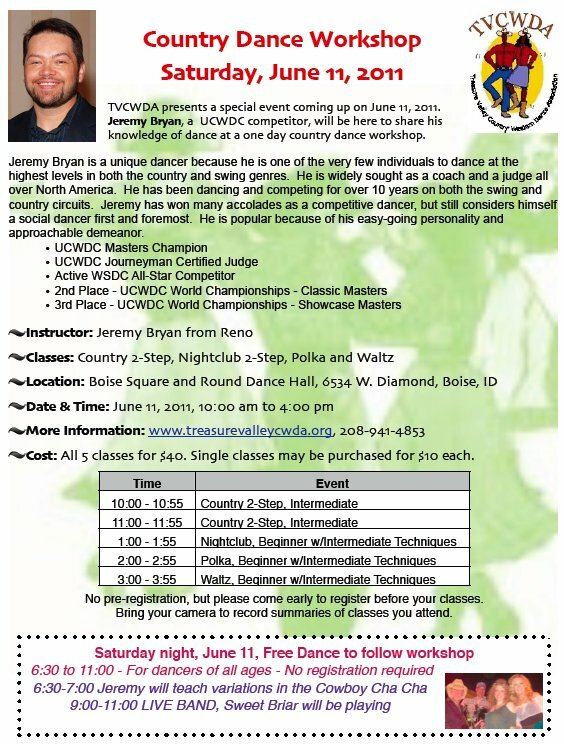 Jeremy Bryan is a well-respected dancer, judge and choreographer on the competitive country western dance circuit. Jeremy travels the nation teaching and competing, though he hails from Reno, NV. He believes that social dancing is the heart and soul of country dancing and his teaching emphasizes that fact. He has earned his way to the highest levels of both the country and swing circuits, but loves to get out and just have fun on the social dance floor as well. This will be his first trip to teach in Boise. He is truly looking forward to meeting some new friends and fabulous dancers! Jeremy is a UCWDC Masters Champion, UCWDC Journeyman Certified Judge, Active WSDS All-Star Competition, 2nd Place UCWDC World Champion-Classic Masters, and 3rd Place UCWDC World Champion-Showcase Masters. Jeremy will be teaching classes in Intermediate Country Two-Step and Nightclub Two-Step, Waltz and Polka. He will also be available all day Sunday for Private lessons by appointment.